Since the Feb. 7 publication of Junhan B. Todiño’s Marianas Variety story, “Group to build Amelia Earhart monument on Saipan,” much has been written about the Amelia Earhart Memorial Monument Committee’s plans to build a memorial to Amelia at the Saipan International Airport. Most of the vocal opposition to the monument is coming from the younger people of Saipan, many of whom have lost contact with their past, and have been subjected to historical revisionism and U.S. establishment propaganda on a grand scale about the facts surrounding Amelia Earhart’s presence on the island in the pre-war years. Marie S.C. Castro, 84, is not among Saipan’s historically challenged, however. In fact, some of the most compelling evidence attesting to the presence and deaths of Earhart and Noonan on Saipan can be found in her fine 2013 autobiography, Without a Penny in My Pocket: My Bittersweet Memories Before and After WWII. Despite enduring hardships under the tyrannical rule of the Japanese during the years leading to the June 1944 U.S. invasion of Saipan and the liberation of its Chamorro residents, nowhere in Without a Penny will you find the slightest a hint of the self-pitying, blame-casting or victim-status seeking rhetoric that has become so common in today’s “social media,” “snowflake” culture. One of the most poignant passages in Without a Penny is Marie’s description of her family’s terrifying ordeal during the American shelling and bombing of Saipan, which resulted in many unfortunate and unintended civilian casualties, as well as traumatic memories for the survivors. These and other notable chapters of a life well lived can be found in Without a Penny. Right now, Marie is fully engaged in the effort to erect the Earhart Memorial Monument; indications are that it could be a long and bitter struggle, and not a penny will come from the local or federal government, which has a vested interest in the memorial project’s failure. 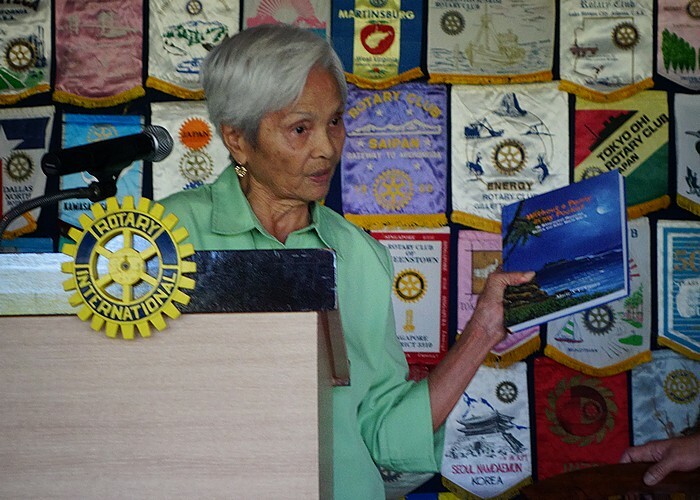 Marie, the vice president of the memorial committee and the driving force behind the initiative to build the monument, told Saipan Rotarians about her interview in 1983 with Matilde F. Arriola who, Castro said, met Earhart when she being held on Saipan following her disappearance in early July 1937. According to Matilde, Earhart died of dysentery. “There is strong evidence that Earhart was here on Saipan,” Marie said. If Marie is correct that all the Saipan elders who were eyewitnesses to Earhart’s presence are gone, and no evidence contradicts this, Marie’s personal connection to Matilde F. Arriola and other eyewitnesses, including Joaquina M. Cabrera, who washed Amelia’s laundry and whose account was also made famous by Fred Goerner in his 1966 bestseller The Search For Amelia Earhart (see pages 101-102 TAL), she is the strongest link to Saipan’s pre-war heritage now living, a role she deeply embraces. Evidently Amelia Earhart was found by the Japanese after she crashed somewhere within or near what may have been the Japanese Mandated Micronesian Islands [Mili Atoll, Marshall Islands], and was subsequently taken to Saipan, which also lay within the Mandated area. The story of the famous American pilot was secretly known by a few men and women who were conscripted by the Japanese and worked for the Japanese government. However, they had no knowledge of the lady pilot’s plight. On a beautiful morning in the late ’50’s my Aunt, Sister Remedios, and I came upon our friend Matilde F. Ariola, who was working in her yard in Chalan Kanoa. Our conversation immediately turned to the subject of Amelia Earhart’s fate. Taking us into her confidence, Matilde related a story of having met a stranger who lived next door at the Kobayashi Royokan Hotel. On a subsequent meeting, Matilde continued, the slender American woman, who wore a short hair style, gave Matilde’s younger sister Consolacion a ring with a while stone, set in a crown mounting. Unfortunately Consolacion was wounded during the war and fell very ill. Before she died of her wounds she gave the ring to Matilde who wore it until after the war. The ring with a white stone remained in her possession during and after the war and was eventually given to her niece Trinidad. Sometime later Trinidad had a stroke. I had an opportunity to visit her and mentioned the ring her Aunt Matilde had given her. Suddenly, she appeared cheerful and in good spirits as she described the ring. However, the ring did not fit well on her finger and she sadly admitted that she had lost it somewhere around the house. Time passes quickly and it was during one of my yearly visits to Saipan in 1983 that I once again had the opportunity to visit with my good friend Matilde. The occasion was a friendly gathering in Garapan, attended by many old friends. In a private conversation with Matilde we rehashed the subject once again: The lady pilot who remains still undiscovered. During our conversation Matilde told me that she had received from Amelia Earhart a small diary in early days [sic] titled “Aviator” that contained many, many numbers, no explanations were offered. Matilde kept the little diary until it was accidentally lost during the war. Sadly, no trace of the diary was ever found by Matilde. It wasn’t until after the war, upon seeing a picture of Amelia Earhart, that she was identified by Matilde as the stranger who had given her the diary. 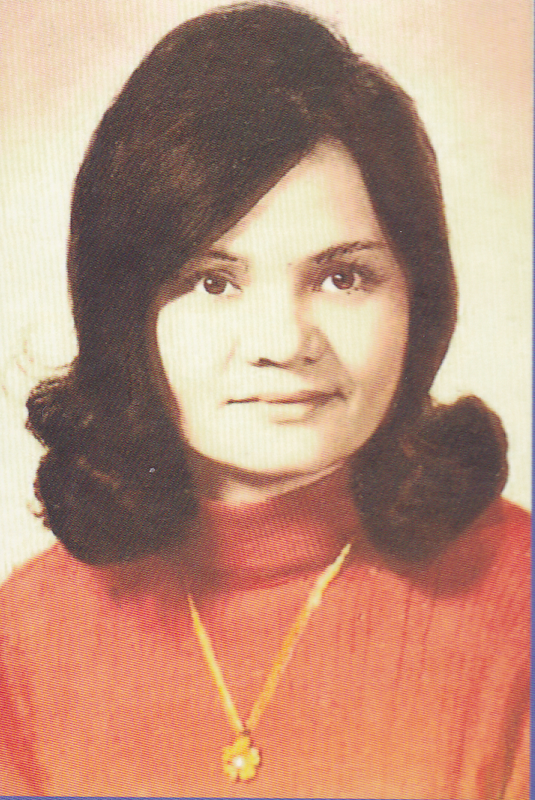 Undated photo of a young Marie S.C. Castro, which appears on the back cover of her autobiography, Without a Penny in My Pocket: My Bittersweet Memories Before and After World War II. After having heard the story of Matilde and the item she received from the woman pilot during the Japanese occupation, the Chamorro law enforcement officers whom I knew did not divulge any information they had at the time for fear of enemy reprisals. Even after the liberation of Saipan, those individuals who possibly knew what happened to Amelia Earhart in Saipan refused to speak. “During the Japanese period, there was no running water,” Marie wrote in a recent email. “The toilet was outside. When Amelia needed the facility she had to go outside to use the restroom. She would stop by Matilde’s house and would peep in to see if someone was around to talk to. One day Matilde gave Amelia a cooked breadfruit, Amelia took it and tasted it. At another time while Matilde was doing her geography homework Amelia helped Matilde on her homework. Amelia took the pencil from Matilde’s hand and wrote something however Matilde did not understand what AE wrote, Matilde didn’t know English at the time. She conversed using signs. Consolacion received a ring from AE. Mariono spoke to AE. “One day Matilde noticed that the lady was ill, pale and used the facility too often that day,” Marie went on. “That was the last day she saw her. The next day the care taker came to Matilde’s house and asked for black material. Matilde’s father, Tun Felipe, was a tailor. Matilde’s father asked the caretaker why she needed black material she said, ‘Kookoo died, the American pilot.’ She continued, ‘amoeba.’ She didn’t know the lady’s name and called her ‘Kookoo.’ Amelia died of dysentery disease.” Matilde died in 1996, at age 83. Opponents of the Earhart Memorial Monument label accounts like Matilde’s and dozens of others from eyewitnesses and others with knowledge as “anecdotal,” proving nothing. But when one considers these, and then adds those of U.S. flag officers such as Adm. Chester W. Nimitz, the Navy’s most revered wartime leader in the Pacific; Gen. Alexander A. Vandegrift, commandant of the Marine Corps during World War II; and Gen. Graves Erskine, a brigadier general on Saipan during the 1944 invasion and second in command of the entire land operation, all attesting to the presence and death of Earhart and Noonan on Saipan, these accounts begin to add up to far more than mere anecdotes. As Marie told the Rotarians in early February, “There is strong evidence that Earhart was here on Saipan.” You decide, but please do so only after you know more about the real facts about the disappearance of Amelia Earhart, facts that can be found everywhere you look on this blog. A shorter, gentler version of this story appeared in the March 28 edition of Marianas Variety under the headline, “Marie Castro: An iron link to Saipan’s forgotten past.” As I said in the opening of this post, massive opposition to the proposed Earhart memorial is endemic on Saipan, and nowhere is it worse than in the brainwashed and propagandized Facebook crowd, where this story garnered a total of just four “Likes.” I could consider this a badge of honor, but I’d much prefer that more were in favor of building this long-overdue monument to Earhart at the place of her death. Far too many on Saipan are dead against it. Ed Williams, 67, a retired Merchant Marine (Military Sealift Command) radio electronics officer who’s lived and worked in many capacities on Saipan since 2004, recently painted a grim picture of the situation on the ground there. “Marie is such a sweet soul,” Williams wrote in a March 21 email. “But not many locals are interested in anything but beer and betel nut. I would say 1 percent of the locals are on the same page as Marie.” Williams, whose father was an Army medic who served on Guam, Saipan and Tinian, where he saw Enola Gay land and actually guarded the B-29 Superfortress bomber that dropped the first atomic bomb on Japan, is doing all he can on Saipan to educate the locals about Earhart’s tragic end there, but he’s a distinct minority. Please consider making a donation to the planned Amelia Earhart Memorial on Saipan (see March 16 story for more). You can make your tax-deductible check payable to: Amelia Earhart Memorial Monument, Inc., and send to AEMMI, c/o Marie S. Castro, P.O. Box 500213, Saipan MP 96950. The monument’s success is 100 percent dependent on private donations, and everyone who gives will receive a letter of appreciation from the Earhart Memorial Committee, suitable from framing. Thank you. Logically, wouldn’t the Japanese have confiscated the “Aviator” book with numbers? And of course now it’s “lost”. Does this make sense to you that the Japanese did not confiscate the so called book with “numbers”? I see your point. It is entirely possible, however, that the Japanese examined the “Aviator” book/diary, deemed it harmless and of no intelligence value, and returned it to AE along with her other personal possessions, as opposed to her briefcase containing maps, charts, and such, which were subsequently recovered from a Japanese safe in Garapan, Saipan in July 1944 by Marine PFC Robert E. Wallack. Surely the Japanese questioned AE about the book/diary and its contents. Her responses must have satisfied them. As we have not seen this book, and have only the barest description of it and the “numbers” contained therein, we do not know. The “numbers” could be anything from telephone numbers to navigational headings, weight and balance, or fuel remaining calculations. And because we don’t know and, at least for the moment don’t clearly see how it fits into the larger picture, we simply set it aside as an anomaly to be vetted out later. In my experience, I’ve found that when you peel back the onion there is a simple, reasonable, and logical answer to most things. I’m confident there is a simple, reasonable, and logical answer to this too. In the meantime, keep in mind that the preponderance of evidence clearly indicates that AE and FN ended up on Saipan in the hands of the Japanese. Let’s not get all in a twist because of what, in the greater scheme of this case, is a very minor detail that, at least for the moment, doesn’t seen to fit quite right. I generally agree with your thoughtful response. So the Japanese didn’t confiscate the “Aviator” book with numbers? Does that make sense to you? And the ring and the book are no where to be found. So much speculation based on no physical evidence. You are clearly a skeptic and a doubter, Mr. Klika. If you want everything to fit perfectly together, I suggest you go to Toys ‘R Us and buy a jigsaw puzzle. Nobody is speculating here about anything. I’m reporting what witnesses have said, that’s it. If you want to nitpick on certain accounts that you don’t think add up, and ignore the mountains of evidence that does, that’s up to you. What a beautiful woman Marie was and still is! My fingers are crossed for this effort on Saipan, Mike! Kudos! Thanks for your good wishes. But it will take more than just good wishes for the Saipan memorial to succeed. I can’t overstate the need for each and every one who believes in this worthy cause to donate whatever they can. Only private funds will make this happen, and we’re facing a mountain of opposition and hate over there. If this effort fails, your money will be returned. This could well be the last real chance we have to actually make a difference in the Earhart cover-up, which is why the noise is loud from those who oppose us. I will donate to the memorial! It would be helpful to get the word out…….in the big scheme of things $200k is not a lot of money….groups could be contacted such as foundations, aviation colleges and aviation associations……. money could even be raised at airshows around the country this summer……and letters to the Bill Gates and Warren Buffet foundations….they are always giving away money for worthy causes…..and using social media…..last month in Phoenix a child was burned badly in a backyard barbecue fire….within 24 hours the family had raised $24,000 on Facebook to help pay for her medical costs. Also, why not contact the groups and schools she was affiliated with…..such as the Ninety-Nines and Purdue University….they should write big checks. Normally you would be correct, and I invite you to contact everyone you think might help. But in this case, on Saipan, the situation is entirely different, and the same people in the establishment and media who have hated and ignored the truth all these years will not help. Normally $200K is not much, as you point out, but in this case it’s an enormous amount because so many are against it. The powers that be understand that if the memorial succeeds, it will put increasing pressure on the feds to disclose the truth, thus the recent media blitz promoting the old TIGHAR lies about the bones found on Niku in 1940. I am not a fundraiser by training, Sandy, and am doing what I can, with very little success. Please feel free to do whatever you can. You have all the information necessary. How about a gofundme page? It seems everyone is doing it and it can be quite successful. It should be run by someone close to the case and has contact with the supporters on Saipan. This would make it easier to contribute and it would be pretty transparent for those who would wonder where the money was going. I don’t even know how a gofundme page words, and the elders on Saipan probably have never heard of them. If someone on Saipan wants to do this, I haven’t heard but would of course welcome it. The politics there are very bad, and sentiment is running 99-1 against the memorial. I think that might be a reason it hasn’t happened yet, Randy. I don’t do or like Facebook or any other social media, and I have tried and found no interest in the Earhart story from the social media mob. People who will support this don’t need anything but a checkbook to help, and are responsible enough to know how to use it. We continue to appeal to readers’ better lights and pray for help from Above, because it’s appearing to be the only Way the memorial is going to succeed. Go Fund Me is a free fundraising platform that allows people to contribute to any cause by simply using their credit or debit card. The site has been used for virtually any needs including medical expenses, funerals, sick children, and literally any other need that people can think of. I was think that you might host the page and send the funds to Saipan with whatever amounts gets generated. Here is their link for your consideration. Thanks Randy. These pages are designed to handle massive, emergency responses. We hear about them all the time on local news. In this case, the response is so tepid that I don’t think I can bring myself to looking at a blank or near-empty Gofundme page, at least right now. If things change or necessitate such a move, I’ll be glad to set one up. When I tried Facebook for a brief time for the blog, I found that although thousands of people wanted to be my “friend,” nobody went to my blog and nobody bought a book. Nothing is difficult about writing a check and putting it in the mail. I mailed my check today to Saipan….and all it took was 50 cents postage on the envelope…and five days in the mail from Arizona. Bless You, Sandy! Thanks so much for caring. Good for you….the monument will be an important memory of poor Amelia and Fred’s demise on Saipan and FDR’s coverup! Given the comments attributed to Ed Williams and Jennings Bunn (locals don’t care about anything other than betel nut and beer and local Chamorros don’t know anything about their own history), it is easy to see why local support is sagging on this project. I hope that these comments were just taken out of context. Marie Castro is an amazing woman. I would consider donating to the monument, but I want to know how it will look and the names of the committee members/government agencies who will oversee it. I accept that Emilia Earhart was in Saipan, but the ultimate meaning of that is an historical curiosity rather than a historical event that determined much of anything in Saipan. The rhetoric on this topic by the advocates is overheated and accusatory. If that was to end up in a memorial, it will detract from the actual event. Given that you can’t correctly spell Amelia Earhart’s name, your comment doesn’t carry much weight, but I’ll post it in the name of fairness and transparency. You have much to learn about this topic and the Saipan opposition to the memorial. I would bet you haven’t read a single good book about the Earhart disappearance, including Truth at Last. I’m not going to further implore you for a donation to a cause that is so clearly and obviously fitting and long overdue. Nothing is going to “detract from the actual event” more than the overwhelming majority on Saipan who oppose it mainly out of sheer ignorance, not to mention the racial element involved. The odds are heavily stacked against the righteous here, and your criticism of the few of us who care so deeply is certainly not appreciated. You can learn everything necessary by tuning in to this blog regularly. I’m not giving out email addresses to committee members in this space, but the committee is headed by Rep. Donald Barcinas (R). I’m sure you can find his contact information with a simple search. As for what the memorial will look like, I’ve posted the “artist’s rendition” of the Earhart monument on the front page of this blog. Did you also miss that in your haste to level your baseless criticisms of the memorial’s advocates? MC- this is a great way to build friends and supporters. Just continue to take on anybody who offers any criticism even when they agree with your basic premise (Earhart was on Saipan). I really was taken aback by the comments attributed to Williams and Bunn. I know Jennings fairly well and I am just assuming that his comments were taken out of context. I wish you well on your project. Apparently, I am just too ignorant and misinformed to understand what is going on. Jennings’ comments were absolutely not taken out of context. This isn’t about me or my tone, of which you don’t approve. Like so many in PC Land these days, the first thing you look for is some reason to be offended. I will advise Jennings about your comment and he can respond if he wishes. Like they say in the Marianas Island – Ai Adai! It still baffles me that many people still refuse to believe such a range of eye witness testimony. Everyone knows that eye witness testimony has flaws, but this can be mitigated against, for example when the range of witnesses is broad and they have no obvious connections: Chamorro natives, Japanese civilians, U.S. military personnel from different services (Army and Marines). When they all yell essentially the same story they make for credible witnesses. Today, if 200 witnesses walked into a police station in response to a missing persons case and told the same story the police would act on it. Yet many people still cannot see, or choose not to see, what is right in front of their eyes. What I like about your approach Mike is that you’re like a dog with a bone. You have your teeth into what is right and refuse to let go no matter what is thrown at you and this is to your credit. Keep up the good work!